Portsmouth fell to Rock Hill on Thursday in conference play, 49-37. PEDRO – Those hoping that the second meeting between the Rock Hill Redwomen and the Portsmouth Trojans would result in the same fashion as the first left Pedro disappointed Thursday night. It was in the Trojans first game of the new year, a home game vs. Rock Hill on January 3rd, that they trailed the Redwomen 24-23 at the halftime break before going on to win 49-40 by game’s end. In similar fashion, Portsmouth trailed Rock Hill 21-16 at the halftime break Thursday night in the rematch between the two OVC schools. To Trojans fans dismay, the second matchup between the two went the way of Rock Hill 49-37 to pick up a home conference win over Portsmouth. Portsmouth took an early 3-0 lead off of a Jasmine Eley made three but would fall behind in the latter stages of the quarter at 13-9. Going into halftime with some momentum on their side after Hannah Hughes’ made three, Portsmouth trailed Rock Hill 21-16. One of the major story lines in the first half was the Trojans ability to defend the Redwomen, and also their ability to fill passing lanes and anticipate the other team’s passes. Portsmouth trailed Rock Hill 32-25 after three quarters, attempting to close the gap with their outside shooting. Jasmine Eley’s late three cut the Portsmouth deficit to 43-37 with 1:10 seconds left, but the Redwomen would close the game out on a 6-0 run to end the game, sealing the Trojans fate at 49-37. Hannah Hughes had a game high 17 points for Portsmouth Thursday to go along with Eley’s 16. 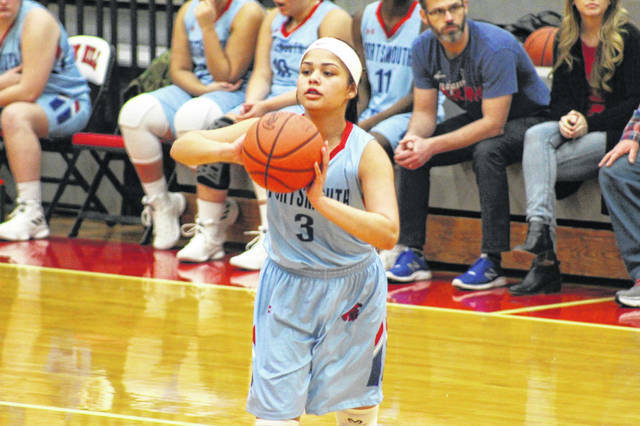 Portsmouth will close their season with a makeup game against South Webster that is still TBD, as well as a road trip to face Gallia Academy on Monday. Rock Hill: 16 FG, 3 3PT, 14/23 FT.